7.97 points at 36 votes (rank 85). Keep Dr. Elvin Atombender from destroying the world by breaking into the building complex and breaking his computer codes. You have eight hours for this job. The game is - concerning the graphics, sound and controls - mostly the same as its forerunner, but new elements were inserted as further robot types and the game area was expanded and divided into 8 towers with each 4-6 rooms and the central tower with the control room. As soon as you are in an aisle, press joystick left or right to run. When you are in an elevator, press joystick up or down to go one floor up or down, or press joystick left and right to enter an aisle. When you are in a room, press the joystick left or right to run and additionally press the fire button to jump. Pull the joystick back to get into the crawl position (is needed to put down the time bomb). When you are standing on a lift or a platform (platform with black-yellow stripes), press the joystick up or down to get the lift going, followed by left or right to move a platform. The lifts can drive through floors or ceilings to bring you to a new room. Keep the stick pressed up to search for passwords or puzzle pieces in furniture or to use the computer. 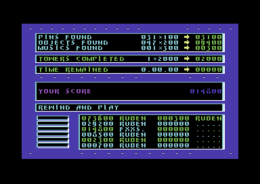 Course of the game: First you need to put together the three-digit combination for each tower, to be able to leave them. Parts of this combination can be found in the fitments. 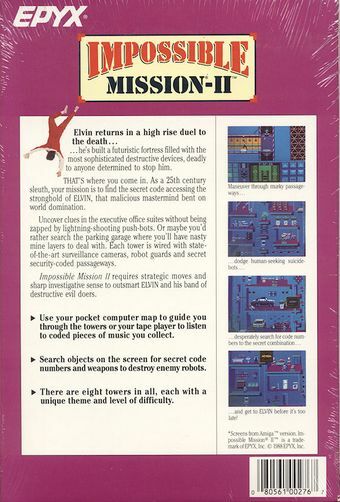 After that you need to find Elvin's safes and open them (with the found time bombs) to get hold of the music sequences. There are six different ones and two duplicates. You need to put together the sequences to a complete piece of music, to be able to open the express lift door to Elvin's control room. Finally, you need to localise the right computer terminal in the control room, which ends the countdown of the rocket start before it destroys you and the whole world. Press the fire button in an aisle to activate the computer. If you use the key 293, you can put together the numbered codes with the up and down keys until the word "complete" appears. Before you leave a tower, you need to take the music sequence from the safe. After leaving the tower you cannot return and if the sequence wasn't by coincidence one of the duplicates, you will not be able to win the game. Use the cassette recorder (cassette symbol) to record pieces of music. In the furniture you can find passwords with which you can take the robots to sleep for some time (they cannot move or shoot at you). With the passwords you can also switch off the lifts. They need to be entered into the computer. Don't touch the robots and don't fall too deep - your "death" costs you 10 minutes! Pushing robots: not deadly when touched, but they push the pawn from the platforms. Mine-laying robots: they put down mines, which are deadly when touched. Lift robots: they drive with the lifts and this way change path settings. To leave one of the eight towers you need a special code number, which differs from tower to tower. The single elements of the number can be found in the rooms. With the menu in the elevator you can set the code number. If FOUND appears, you have the right number, if it says COMPLETE all three positions are correct. In each tower you need to find the corresponding safe and crack it. Then you get a song, which you record with the cassette recorder until you have together six different pieces of music. In the altogether eight towers there have to be two song twins. If you get the same song, you need to rewind the recorder by 25 units. If you have the six different ones, go into the connecting aisle between two towers. It is guarded by two lions, which only let you through, if you know the code number! Sometimes you come across skulls - at first you should pay no attention to them, but move the joystick upwards: A trap door opens and brings you to the tower no. 9. Immobilise the robots, grab the bomb, jump from the moving elevator at the upper right, blow a hole into the ground and let yourself fall through. 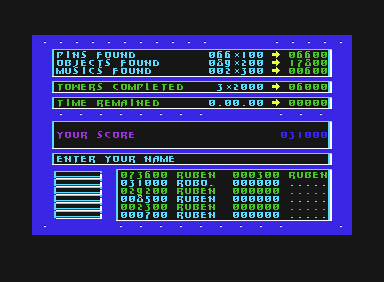 The version by "Lurid & Tricycle (L+T)" has next to a saveable highscore list also some cheat modes (3). After entering the name in the highscore list just ignore the message concering the rewind of the tape. Just press the fire button. The version by "Nostalgia (N0)" contains next to the manual even more cheat options (10). Robotron2084:"Well, I don't quite know...the game doesn't quite put me on fire. The graphics in the rooms is a bit fuzzier than in IM1 and this permanent pink/cyan/azure mix rather hurts the eye after a while. The sound is almost identical to the forerunner's, even some samples were recycled...virtually embarrassing! The gameplay has been expanded by a few - as I think - not worldshaking details and as the game is divided in sections this time, I personally feel kind of cramped. IM2 is certainly a good game, but leaves me somehow slightly helpless and unconcerned. Maybe I just have to play it a few times, until it makes "Click!". I'd give 7 out of 10 points." Flexman:"For me, the game was at that time even better than the first very good part, as it was much clearer what to do without a manual. In addition, the difficulty grad is not as high as in Impossible Mission I and with the mines and bombs you have more and more creative possibilities to switch off the robots. Furthermore, now there is the possibility to save the game status. I liked the graphics from the first part, but this is also okay; the title music is also very good (but designed for the old SID 6581), the end sequence also satisfied me at that time. Therefore, I give here - as for the first part - 10 out of 10 points." This is the second of altogether three parts: Impossible Mission 2025 should be named as third part, but was not converted to the C64. 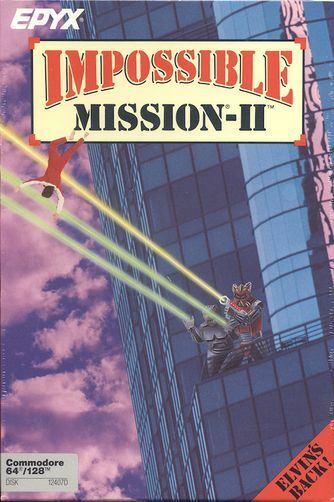 Impossible Mission II was next to some other games on the C64DTV. Only the Commodore 64 disk version saves highscore tables on to diskette. This feature is not available in the cassette version.